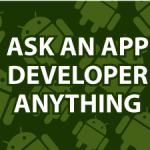 In this video I had the privilege of allowing my community to ask an app developer anything. I spoke with Eugeny Krouglov of MaxNick.com. They won the Samsung Smart App Challenge. They have developed 9 apps that are on both the Google Play and Apple App Store. Their apps have been downloaded millions of times. Their list of games include Sword Vs. Sword, Spider Jack, Dots Out, Curling 3D and many more. As you’ll see in the interview, Samsung did a great deal to help MaxNick achieve great success. Both the Samsung Developer Network and the Samsung Smart App Challenge have done a lot to help small developers achieve great things. Who knows, maybe someone watching this interview will be this years winner? That was a really good interview!!!. Eugeny changed my perspective about the publishers, I used to think that they would keep most of the profits without putting any effort into the game. He is such a great guy and so humble, I really enjoyed the interview, thanks for doing this kind of things Derek. Really enjoyed the interview,it’s nice to get a developer with his experience perspective on things. Keep up all the great work. I’ve been trying to learn android app development for awhile and really enjoy your videos! Thank you very much 🙂 i’m happy that you enjoyed it. Great interview, very useful information for people who are to programming like me. Thanks for that interview Derek! I watched it last night before bed and it was very informational. You’re very welcome 🙂 I’m glad that you liked it. I think I’ll be able to post the questions on Tuesday. Then I’ll give everyone a few days to answer them. Those who answer correctly will be contacted through email so that they know when the live drawing is going to be. I wish you the best of luck. I wasn’t able to watch the interview live but just finished watching the taped version. Very impressive. I’m retired and have been looking for something new to keep me occupied. I started viewing you videos on Inkscape for my interests in both 3D printing and laser burning art work. I came across the vids for Android apps and have been viewing them almost everyday to try and get the technology into my head. And now this interview encourages me even more for using my creativity into developing various apps. I’ve already listed a dozen ideas I have for games and am anxious to really learn how to develop them. Thank you both, Derek and Eugeny for bolstering my enthusiasm. Welcome to the wonderful world of Android app development. It is funny, but I have made about 50 videos and I still haven’t scratched the surface to what is possible. Wait until you start creating your own electronics to your apps. I have been doing that for the last 2 years and its absolutely amazing. Many more videos are coming. I’m very happy that you are enjoying them.